We did it. 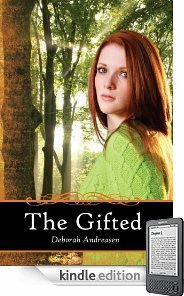 We've made The Gifted available on Kindle. Before it was really even up and running, I sold 4 Kindle copies. Hopefully that's a foreshadowing of successes to come. I downloaded the free excerpt onto my own Kindle and had the Kindle read it to me. Can I tell you how bizarre that is to hear my words coming through someone else's voice? It was strange, yet satisfying. Next phase for the Gifted? It will soon be available on Barnes and Noble for our faithful Nook readers.